Javier Ramon Brito is a Holistic Consultant who can give you advice based on Ayurveda, Alternative Medicine, the Chakra system, the Body Meridians, Flower Remedies, Kinesiology, Numerology, Scientific Dowsing, Sacred Geometry, Emotional Freedom Technique (EFT) and other holistic healing arts. His advice is oriented towards helping you to naturally heal your body, manage your emotions, use your mind effectively for manifesting purposes and meet your soul's needs. He is also a Sound Healer who offers you sound healing frequencies and advice to balance specific chakras, body organs or meridians of your body. He can identify your personal healing musical scale and make a voice analysis test to detect the "missing tones" in your current life. Javier Ramon is also a composer, a Healer Musician and a recording artist of Spiritual Healing Meditation Music for Wellness. He composes meditative music to nourish the soul, facilitate sacred connections, and attain spiritual joy. He describes himself as an intuitive Healer Musician. A firm believer in the healing power of music, he wonders not why musicians are often compared to medical doctors. “I am like a psychologist, because I work with people’s emotions and dreams”, he jokes. “Or like a kinesiologist, because I believe music can balance the meridians of the human body”, he adds. Javier Ramon Brito’s philosophy of life has been enriched through the years with the study of various spiritual and holistic disciplines. 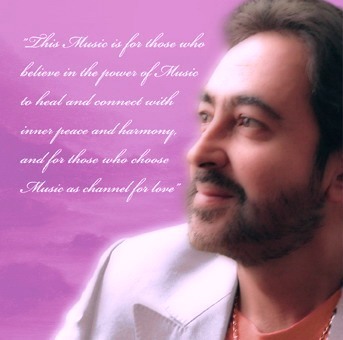 He composes music with a clear intention to promote spirituality and joy. “Spiritual awareness and enjoyment are often considered as opposites, but I believe they go hand in hand, so both are important ingredients of my music”, he remarks. His albums “Expression”, “Gratitude”, “Trust”, and “Peace" are all available online in CD and digital formats, and from his music website of SPIRITUAL HEALING MEDITATION MUSIC, which also includes healing resources, online radio, testimonials and reviews.